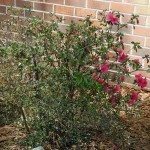 I have an old azalea bush that is covered in a greenish, powdery looking growth. Many of the limbs have sparse flower and leaf growth, and a few have healthy looking vegatation. I pruned most of the dead wood this winter. This bush has been beautiful in the past and I would like to save it. Should I prune it almost to the ground in an attempt to save it?